Today I have the pleasure of introducing Jeff Gawronski, the Founder and CEO of DormCo.com. 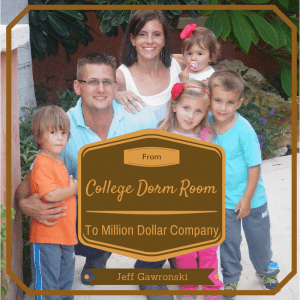 Jeff has such an interesting story about starting a business in college, setting it aside for a few years, and then making it super successful after graduation. Jeff graduated from Xavier University in 2001 and actually started working in pharmaceutical sales with Pfizer in Utica, NY, not far from his Hometown of Buffalo, NY, where Jeff was born in 1979. In May 2004, after three years with Pfizer, Jeff quit a successful career to launch his first company in Louisville, KY. Jeff sold his first business in summer 2009 and moved back to the comforts of home where he launched DormCo.com in March 2010 (his original college dorm room idea). Besides Jeff maintaining and growing DormCo.com, he also enjoys time with his wife Heather and four children; Caswell (5), Ashlyn (4), Jack (3) and Quinn (1). I would describe DormCo as a products-focused company. A company that seeks high quality at affordable prices. I would describe myself as someone who strives to always do better and someone that can learn from everyone around me. You started in college – what drove you to invent your first product? Necessity. I was on the top bunk, had no place to keep my alarm clock and before you knew it I was drilling in my basement. While you didn’t sell much, you did sell some? How did you balance work and school? Yes… but it was short lived. Xavier (my alma mater) deemed my efforts “solicitation”, so as I was run off campus so I took my remaining units and saved them. I never had to worry about balancing work and school as I only sold units prior to school officially beginning. Really just the business. Sure I have a little money in Scotttrade, but by and large I don’t like investing in things I have no control in so I either pump it back into the business or I go ultra safe with a bank savings account. Has that changed over time? Has it changed vs. not having money? Sure. Before my business there was $0 at Scotttrade, $0 in Savings, and $0 in checking and a nice, hefty amount owed on my credit cards or line of credit. The cushion is relatively small, but at least now there is some cushion should disaster strike. What’s your best advice for spending/saving for college students and young adults today? Save. Save. Save. At 21, I had an amazing job as a drug rep with Pfizer. I pinched my pennies so hard because I wanted FREEDOM – freedom is better than any tangible item you can buy. I even lived with a stranger to split my rent all the way down to $280 a month in a cheap apartment all while making a six figure salary with Pfizer. Why? Not because I’m crazy, but I knew to start my own business I’d need cash flow to live on, so I socked it away. Ultimately that provided me the freedom and ability to quit and launch my own business. I can’t name a lot of 22 year olds making six figures that would do such a thing. But my desire for the freedom to start my own business would outweigh any physical purchase or living arrangement… so far I was right. You left your job to pursue your business – that’s a big step that most wantrapreneurs can’t overcome. Tell me about it and what finally made you leave your job? In truth my answer either gets people to say ‘thank you’ for sharing your story or it gets them really annoyed, or even pissed off at me. My reality is very spiritual. Truth is, I never thought I could quit my job. In fact, I liked my job at Pfizer and I was good at it. But one day I found my old unsold bedpost shelf units in my closet and couldn’t shake it. It was almost as if God was saying to me there was a purpose on why I still had these units long after (over 2 years) I got chased off Xavier’s campus. I couldn’t sleep for days. I couldn’t shake the overwhelming feeling that perhaps I wasn’t supposed to be with Pfizer and that God had a different vision for my life. Although the idea of having a company sounded ‘cool’, it wasn’t really what I felt like I wanted. I had a successful career. I enjoyed and it would take a lot of prayer to discover if I was capable of running my own company. I didn’t think a company could start off of one product, let alone a shelf for bunk beds, so my prayer to God was simple. My prayer was one for confidence. If I was truly supposed to do this, I told God I needed Him to ‘hold my hand… to help me see I was capable’. And boy did God show me. This time of prayer happened in my first year with Pfizer and in my second and third year at Pfizer, I became a top 5 person within the company in sales and was rewarded within the “Circle of Excellence.” There were other aspects that showed I was a strong & capable business person, but being top 5 at the ages of 23 & 24 was beyond what I thought was possible. I realized, yes it was my hard work, but it was also what I believe was a flashing green light answer to my prayers in my request to know what to do with my life. In essence, due to my faith, I had no option but to quit. I left Pfizer when 10,000 bed post shelves were coming in from China without 1 unit pre-sold…. Absolutely INSANE. But it was time to quit and begin the adventure. Nothing really… I think it all happens for a reason. The good, the bad, and the ugly all make me and my current company what we are today. Working on making DormCo.com more of a household name. Creating great products with smart marketing outreach. I have learned so much that if I had free time, I’d probably write a book. I think you have to do it all for the right reasons. If you have a passion, follow it! If you are doing it because you think you’ll make quick money, then turn and run away from it. Regarding money: I see younger people often don’t connect the dots in life. What I mean is, what you do today effects who you are and what you do in 5, 10, 15 years. It all adds up. Learn now, live frugally and work hard … these concepts will put you in a strong position later in life. I love Jeff’s story, especially when he talks about how he made the leap from wantrapreneur to entrepreneur. I know that it is incredibly hard to make that jump, and I appreciate Jeff sharing his story about how he felt called to change his life, and that proof was laid out for him. I can see where some people may criticize that, but I think that everyone has their own journey, and that was Jeff’s. I also think that Jeff’s advice on money is incredibly valuable: save, save, save! Even if you don’t want to start your own business later in life like Jeff did, it is incredibly important to save. Maybe it means that you can retire earlier? Maybe you can take awesome vacations? No matter what the future holds, save more now! What did you learn from Jeff Gawronski’s amazing journey?